The World Cocoa Foundation (WCF) and the Swiss State Secretariat for Economic Affairs SECO jointly convened a cross-section of more than 200 representatives from the chocolate and cocoa industry, cocoa-producing countries, development agencies, donor groups, non-governmental organizations and cocoa certifying bodies. The gathering, themed “Innovations in Cocoa Sustainability: People, Planet, Profit”, was held October 24-25 in Zurich, Switzerland, and focused on improving efforts to boost incomes, production levels and technology for the world’s more than five million cocoa farmers. Bill Guyton, president of the World Cocoa Foundation, said that the partnership with SECO was a natural choice for WCF. “SECO and WCF share a commitment to helping cocoa farmers improve their livelihoods. We at WCF bring industry’s perspectives to the meeting, while SECO provides the expertise and resources of a development agency. It’s a win-win for our agenda and ultimately for farmers”, he said. The two-day meeting included sessions on new strategies for agricultural development in the cocoa sector; defining and measuring success in programs to support cocoa farmers; direct sourcing & sustainability; the increasing role of women in cocoa farming; and efforts to address the worst forms of child labor in cocoa in Côte d’Ivoire and Ghana. An Innovations Symposium during the meeting highlighted new technologies and innovations in the cocoa sector. Massimo Garavaglia, President Western Europe and Executive Committee Member of Barry Callebaut and Moses Asaga, Minister of Employment and Social Welfare, Republic of Ghana, delivered keynote addresses. Cocoa sustainability experts from the Bill & Melinda Gates Foundation, the World Bank, WCF, SECO, chocolate/cocoa companies and development agencies served as speakers for the meeting’s sessions. During the meeting, WCF announced that Nicko Debenham, director of development and sustainability at Armajaro Trading Ltd., had been named as its chairman for the 2013-2015 term. Debenham most recently served as WCF co-vice chairman and has more than 25 years’ experience in the West African cocoa sector. WCF also used the occasion to proudly announce its 100th company member. The news came at WCF’s semiannual Board meeting, taking place here one day ahead of the organization’s 23rd Partnership Meeting and Roundtable Sessions. The WCF Board paid tribute to current Chairwoman Anne L. Alonzo, who will successfully complete her two-year term on December 31, 2012. Alonzo said, “I am pleased that Nicko will be leading the World Cocoa Foundation and am confident that he will continue to shine a light on the challenges faced by cocoa farmers, their families and their communities. I have been privileged to serve as chair and am so very proud of WCF’s work. I will gladly support the chair and WCF’s efforts going forward”. In addition to Debenham, WCF announced that Michiel Hendriksz, Europe-based director of sustainability at Archer Daniels Midland Company’s Cocoa Division, will serve as secretary/treasurer for 2013-2015. WCF’s 17-member Executive Committee also gains two new small business representatives: Francisco Gomez, director of ingredients and international business at Casa Luker (Colombia), and Juan Fernando Valenzuela, director of agricultural promotion and commodities purchase at Compañía Nacional de Chocolates SA (Colombia). WCF thanks the Partnership Meeting sponsors for their generous support: Swiss State Secretariat for Economic Affairs SECO; Barry Callebaut; Mondelez International; ADM Cocoa; Armajaro Trading Ltd.; Casa Luker SA; Lindt & Sprüngli; and Transmar Commodity Group Ltd. The next WCF Partnership Meeting & Roundtable Sessions will be held in Washington, D.C., June 5 – 6, 2013. The WCF Cocoa Community Development Fund (CCDF) supports cocoa communities in Côte d’Ivoire by funding community-identified projects and scientific research where WCF and WCF member-supported programs are currently based. The CCDF does this by providing small grants in three core areas that have proven successful in program work: Community Challenge Grants, Cocoa Family Scholarships, and Cocoa Research Exchanges. 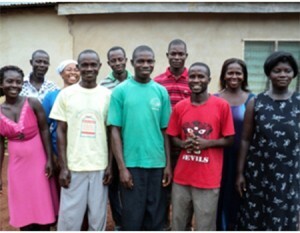 CCDF was made available through a one million dollar private grant with associated WCF member company contributions to intensify reach over the two-year grant period and is getting started in November 2012 in a three step process: 1) finalizing member company contributions; 2) working hand-in-hand with members companies to select communities and implementing partners; 3) implementing the three core activity areas in concert with other programs to maximize impact and foster private-public partnerships. 1. Community Challenge Grants: Community Challenge Grants are designed to provide small infrastructure and service provision around community identified needs to address gaps that hinder livelihoods and education development. Grant activities will be based on community action plans and/or assessments. 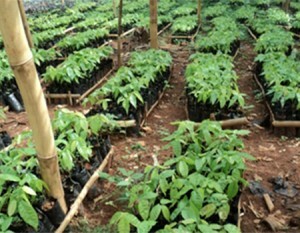 For example, where WCF-Cocoa Livelihoods Program works in conjunction with 16 member companies, production trainings that teach farmers good agricultural practices could be complemented by the construction of cocoa storage shelters so that farmers can more easily put to use their new knowledge. 2. Cocoa Family Scholarships: Cocoa Family Scholarships expand business opportunities for women in Côte d’Ivoire. The scholarships are used to simultaneously support youth education and increase retention probability from the primary to the secondary level while enhancing the mother’s income-generation potential. 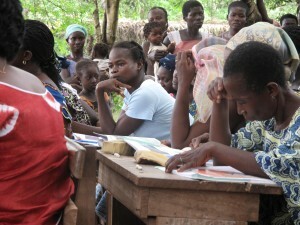 Women scholars are selected based on a set of criteria that will include income, number of children in the household, age of children in the household, number of existing businesses that have been operating for at least one year, and the baseline profit lines of each business, so that the grant is used to invest in an existing business while supporting one child’s education and schooling. The scholar has time and fewer restrictions to expand her business for a sustainable income stream. Scholars are also linked with a mentor to provide one-on-one guidance and training about basic business skills. 3. Cocoa Research Exchange: Since 2007, approximately ten African cocoa scientists have completed a cocoa research exchange and fellowship, and over the course of 2013 and 2014, approximately six additional fellows will complete scientific research exchanges. During their fellowships, participants are mentored by American scientists to begin or finish cocoa related research, which has included work on soil fertility, improved planting materials, pest and disease control, and other scientific research that support sustainable cocoa production. The CCDF will support cocoa scientists participating in scientific exchange programs, as well as support follow-on activities in-country. These three activities help to strengthen ongoing work and reach higher numbers of beneficiaries within cocoa growing communities and within the research sphere, where innovation directly help cocoa farmers to grow more, and higher quality, cocoa. 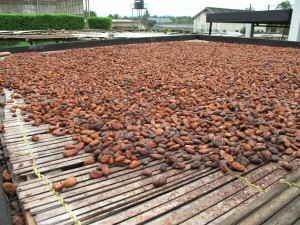 Please go to www.worldcocoa.org for more information and to track CCDF results over the two-year period. Cocoa Measurement & Progress, known as CocoaMAP, is a global online platform for measuring progress and tracking results in sustainable cocoa. The innovative platform is envisioned to be a web-based system with tools and data to track activities and key indicators across the cocoa sector, with a focus on sustainable cocoa systems and practices. This initiative is being developed by WCF and supported by its membership of over 100 companies and brands around the world. In addition, a broad network of stakeholders including development agencies, producing country governments, NGOs, and research institutions have provided guidance and expertise to help launch CocoaMAP. WCF plans to launch the system online by early 2013. WCF has joined with the software company aWhere, based in Boulder, Colorado. 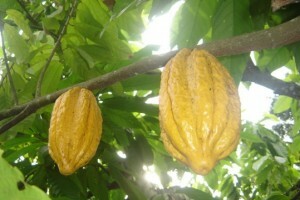 The company will develop the data management system and collection tools for CocoaMAP. Following an extensive review of several leading software companies, WCF selected aWhere as the service provider to develop the system, support the data collection pilots, and launch the reporting tools over the coming months. Over the coming months, aWhere will work with the WCF technical unit and program staff, independent consultants, and multi-stakeholder working groups on CocoaMAP to refine the indicators to be measured and tracked. The amount of cocoa produced annually, the number of women cocoa farmers in leadership positions within farmer organizations, and literacy rates in cocoa communities, are but a few of the indicators that will be tracked. WCF and aWhere will also further refine data collection methodology, pilot collection tools and surveys in the three pilot countries of Ghana, Cote d’Ivoire, and Indonesia, with initial data collected for the first CocoaMAP report to be generated in the first quarter of 2013. The final months of 2012 herald a transition for WCF. I would like to devote some time here to a look back on this year’s accomplishments, while turning toward our priorities and challenges for 2013 and beyond. The success of WCF over the past year undoubtedly has revolved around dedicated individuals who have helped us grow and improve our profile and effectiveness. This includes our officers, member companies, staff and partners. The end of 2012 marks a change in the organization’s governance structure, with the departure of our current chairwoman, Anne Alonzo, and our secretary/treasurer, Andy McCormick. Both have provided energetic and deeply appreciated support during their two-year terms. Under Anne’s leadership and that of our executive committee, WCF successfully pursued partnerships with the governments of Côte d’Ivoire and Ghana, the G-8, International Finance Corporation, U.S. Peace Corps, and World Bank, while strengthening our relationships with the Bill and Melinda Gates Foundation, USAID, GIZ, and others. With a new communications/outreach department in place, we launched a new website, revised and significantly improved our annual report and other communications tools, and in recent weeks we reached the milestone of 100 member companies. If there is a single theme that unites WCF’s past and future, it is surely summarized in one word: innovation. At our recently concluded Partnership Meeting in Zurich, I was encouraged by the example of one new innovative project called Digital Green. Developed in India, this cost-effective approach to farmer training uses short videos, created and produced by the farmers themselves, to record best practices in farming and then share them with the local community. Built into the system are mechanisms for accurately measuring the impact of the project. WCF intends to utilize this technology in our Cocoa Livelihoods Program, just one example of how WCF strives to incorporate new approaches in our mission to provide cocoa farmers and their families with the tools they need to succeed. The initial goal of introducing Challenge Grants in WCF ECHOES communities was to encourage community-based groups to identify development challenges affecting their community and propose their own strategies to address these issues with funding support from the WCF ECHOES. Through informational programs, workshops and training programs for the communities, we saw groups emerging voluntarily to champion their own development programs. Across all communities, community members identified unemployment as a major issue, and sought to develop strategies and alternative livelihoods to complement income from cocoa farming. The Sustainable Agriculture Group (SAG), of Yawkrom in the Akontombra District of the Western Region of Ghana, addressed their community’s unemployment issues with an innovative proposal. Through $1,700 funded by the Challenge Grant, SAG raised 20,000 hybrid cocoa seedlings at subsidized rates to ensure that community farmers had affordable access to the seedlings, while simultaneously promoting the planting of hybrid cocoa, resulting in higher cocoa yields for farmers. Now in their second planting season after receiving Challenge Grant funds, the group has turned a profit of $2,400 to date. Thanks to the success of the sale of hybrid cocoa seedlings, SAG was able to procure agricultural materials and tools to support its current members on their cocoa farms. All ten group members each received four bags of NPK fertilizer, two bottles of liquid fertilizer, two bottles of herbicide, as well as a $54 loan. In addition to loan repayment, all group members will be required to reimburse SAG during the next major harvest in November for the cost of the agricultural materials procured with SAG’s support. SAG has gained valuable knowledge through the WCF ECHOES program, in addition to the funding they have received through the Challenge Grants. Thanks to this innovative program, SAG members have not only increased their financial income and are leaders in agriculture extension within their communities, but are also putting into practice lessons learned through WCF ECHOES’ leadership interventions to play the primary role in their development, advocating for the needs of their families and communities. The U.S. Department of Labor (DOL) has awarded a $1.5 million cooperative agreement to Tulane University’s Payson Center for International Development to carry out research on the prevalence of child labor in cocoa-growing areas of Côte d’Ivoire and Ghana. Tulane will develop a baseline estimate of the number of children engaged in the worst forms of child labor in these areas based on survey data from 2008-2009 as well as a new survey of activities during the 2013-2014 cocoa harvest season. As part of this award, Tulane will provide technical assistance to help enhance the capacity of the countries’ national statistical offices to conduct similar surveys in the future. Tulane also will develop a manual that can be used to replicate its research design and survey implementation methodology. 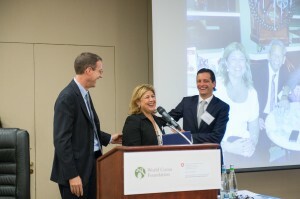 According to DOL, the award illustrates the Labor Department’s continuing commitment to achieve the goals of the 2010 Declaration of Joint Action to Implement the Harkin-Engel Protocol, which was signed by Secretary Hilda L. Solis, the labor ministers of Côte d’Ivoire and Ghana, and a representative of the International Chocolate and Cocoa Industry. The international chocolate and cocoa industry has committed to funding programs under the declaration. To date, eight WCF member companies (Barry Callebaut, Ferrero, Hershey, Kraft, Mars, Nestlé, Archer Daniels Midland and Cargill) have allocated another $10 million to reduce the worst forms of child labor in cocoa-producing areas of Côte d’Ivoire and Ghana. 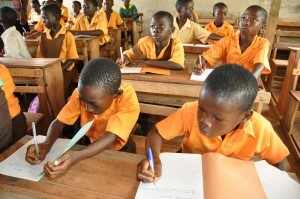 All of these programs are designed to reinforce broader efforts being undertaken by the governments of Côte d’Ivoire and Ghana to address child labor, including the promotion of educational opportunities for children and economic opportunities for their households, and the expansion of community-based child labor monitoring systems and social protection services. The World Cocoa Foundation (WCF) has announced the selection of seven cocoa research scientists from five countries for fellowships through the WCF/U.S. Department of Agriculture’s Norman E. Borlaug International Agricultural Science and Technology Fellowship Program Global Cocoa Initiative. The scientists, representing research institutions in Costa Rica, Côte d’Ivoire, Ghana, the Philippines and Vietnam, will complete a 2-3 month fellowship in the United States beginning in early 2013. 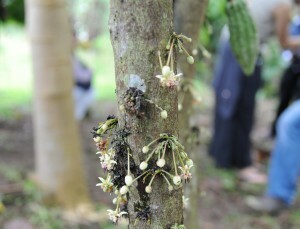 The presence of a Vietnamese cocoa research scientist is unprecedented in the five-year history of the program. Research to be conducted during the fellowships will focus on factors known to affect cocoa production, including swollen shoot virus; black pod; shade management/intercropping; insect pests; and the effects of farming practices on pollinators. During the program, scientists acquire skills and knowledge that can be shared broadly upon their return home. In turn, mentors, identified by the program and who work with the individual scientists during their stays in the United States, travel to the scientists’ home countries to broaden the program’s impact. Since 2000, the World Cocoa Foundation has been furthering the development of the cocoa sector in Vietnam by supporting research to adapt cocoa production to local growing conditions. This is accomplished by working with researchers at Nong Lam University located in Ho Chi Minh City, Vietnam. Key areas of research include: planting material, pest/disease control, cultural management, fermentation and farming systems. In the area of planting material, Nong Lam University conducts trials to identify the best planting material to recommend to farmers. Once identified, the university works to propagate this material for distribution to farmers by establishing budwood gardens and providing training support to small-scale private nurseries. In Vietnam, the two main pest and disease issues are mirids (Helopeltis spp.) which feed on cocoa pods and young shoots, and Phytophthora palmivora which causes black pod rot and stem canker. Researchers at Nong Lam University are studying control methods for these issues including identification of cocoa varieties that are tolerant and development of natural means of control. For example, some species of ants can be used to protect the cocoa pods from mirids. Cocoa in Vietnam is grown in a number of different environments from relatively flat areas of the Mekong Delta to the sloping areas of the Central Highlands. Different growing conditions require different adaptations. Nong Lam University researchers this and transfers technologies to farmers. For example, some areas of Vietnam experience a prolonged dry season during which the cocoa needs to be watered. 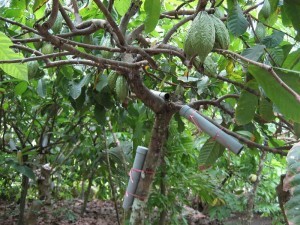 Researchers at the university developed a low-cost drip irrigation system which allows farmers to efficiently water their cocoa during this period. Some innovative farmers have also adapted the design to provide running water for household use. When one thinks of Ecuador, an image of fine flavor, good quality cocoa comes to mind not only for traders, processors, and manufacturers, but also consumers. An estimated 100,000 families grow cocoa which represents close to 60% of the global fine flavor cocoa production. According to the latest LMC report (Oct 2012), Ecuador’s cocoa production for the year 2011/12 was 190,000 tons which is a record volume for this key origin. For this crop to continue providing a good economic alternative to farmers and providing sought-after beans for the industry, much work needs to continue. The presence of different fungi: frosty pod (Moniliophthora roreri) and witches broom (Moniliophthora perniciosa); aging trees; and inadequate agricultural practices have all led to low tree productivity that is not sustainable. It will require collaborative efforts of farmers, Ecuadorian government, international development community, research facilities and the chocolate/cocoa industry to focus resources and efforts in addressing these issues. Additionally, weather affects, and has a direct impact on, cocoa production. According to the latest reports from the International Research Center on “el Nino”, this year Ecuador will not face an increase in the intensity and frequency of rain, which in previous years has reduced the cocoa production by 30 – 40% and caused extensive damage by flooding farming communities. For further details on the report please CLICK HERE. In an interview in Forbes, USAID Administrator Rajiv Shah discusses the Agency’s commitment to cultivating public-private partnerships that produce substantial development results. Together with philanthropic organizations, corporations, governments, and multinational organizations, USAID is setting ambitious goals and taking on some of the world’s greatest development challenges. Since August 2012, WCF has welcomed 12 new members: Agro-Traders Limited, COCOCO Chocolatiers Inc., CropLife Africa Middle East, CWT/SITOS, Diamond Bank, H.D. Cotterell, Hussel Confiserie, Pronatec AG, The Raul Ocazionez Foundation, TCHO, Ülker Çikolata, and York Trade Corporation. WCF also welcomes one new staff member: Henrietta Baaba Wood, Administrative Assistant (WCF/ACI – Accra).